The Lower Falls Improvement Association (LFIA) Riverside Committee, a.k.a. RightSize Riverside, opposes Mark Development’s current plan to cram 1.5 million square feet of apartments, offices, retail shops, and parking into the MBTA Riverside Station site. We believe the proposal would bring crushing traffic to the surrounding neighborhoods and limit the site’s ability to become truly transit-oriented. RightSize Riverside urges the Newton City Council to reject this plan – which is more than double the size of a mixed-use plan the Council approved in 2013 – and to work with the developer, city planners, and residents to negotiate a project that meets the pressing need for affordable housing without straining the capacity of area roads, schools, and infrastructure. RightSize Riverside is concerned not only about the adverse impact of this massive development on Newton Lower Falls and Auburndale, but about the cumulative effect of Riverside and other major projects being planned or built in Newton. Let’s Get Riverside Right. The LFIA Riverside Committee has given several presentations to spread the word about oversized development at Riverside. 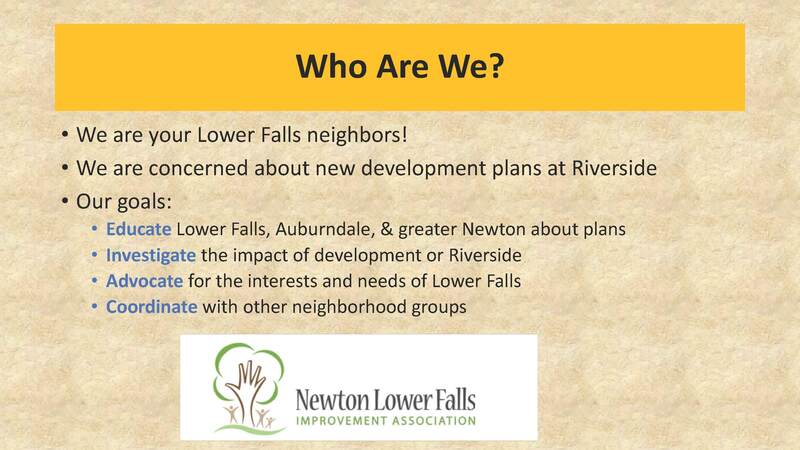 The Newton City Council’s Land Use Committee invited us to speak at its public meeting on March 14, 2019, in response to Mark Development’s presentation of its Riverside plan. You may View these slides and download our remarks here. A video of the Land Use meeting (3.5 hours), filmed by NEW TV, is available on its website. This includes the presentations by Mark Development and the LFIA Riverside Committee, as well as public comments. This slide show, from January 2019, offers a history of Riverside development and highlights our concerns about Mark Development’s plan.